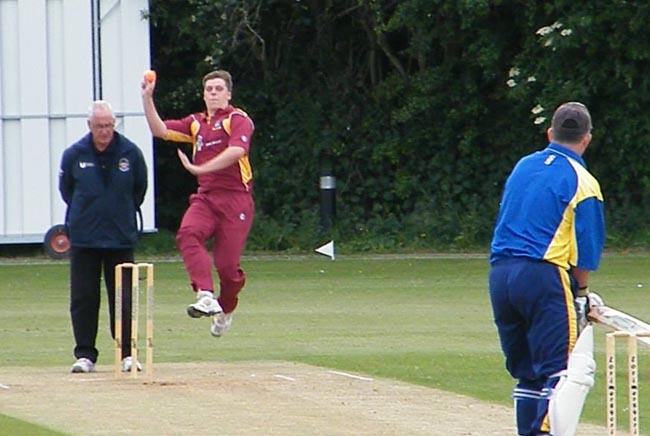 Newton Aycliffe’s cricket team have got one hand on the NYSD League title after a Bank Holiday win at home to Billingham Synthonia. The first team recorded an excellent six-wicket victory over fourth-placed Synners’ second XI at Aycliffe Sports Club on Monday. It puts Aycliffe 14 points clear of second-placed Bedale with just three games remaining. In hot and sunny conditions on Monday, Billingham won the toss and chose to bat first, but Aycliffe skittled them out for just 86 after 26.4 overs, with Luke Telford taking five wickets for nine and man-of-the-match Michael Howe (pictured) getting four for 18. It took Aycliffe 28.3 overs to reach their winning target, conceding four wickets, with Adam Gittins scoring 27 not out and Luke Telford 20. Aycliffe’s game away to Preston’s first XI last Saturday was abandoned after just one over due to rain, with Aycliffe 12 for 0. A fixture-free Saturday gives Aycliffe a weekend off, although our second team are away to Norton’s third XI on Sunday. • The first team’s next game is at home to second-bottom Blackhall on Saturday 7th September (1.15pm).